In most relationships – business or personal – there comes a time when the person in which you have been involved decides it is time for you to meet the parties for which they are associated or tied. In business it may mean meeting the boss. When dating, it usually means meeting the parents. Invariably if your relationship is to continue these meetings require at least minimal discussion on straightforward and touchy subjects; morals, positions on topics of the day, race, religion, and sexual orientation. At best this experience is full of angst. At worst the experience proves to be a nightmare. Jordan Peele’s clever film Get Out projects all the elements of such an event and more. Get Out provides comedy, drama, horror, and thriller scenes in taught fashion. Peele (Key and Peele, The Daily Show, MAD T.V.) sets up the viewer to be the observer\participant in Get Out. Get Out deliberately telegraphs foreshadowing on foreshadowing – so as to convince you that you know where this story is going and are simply along for the ride. Sometimes you are right and sometimes you are wrong. Regardless, the trip is fun viewing. Get Out stars Daniel Kaluuya (Sicario) and Allison Williams (Girls) as the handsome couple in love. Both are superb in their roles and Peele’s dialog for both cements their believability. The parents are played by Katherine Keener (Capote, 40 year-old Virgin, Out of Sight) and Bradley Whitford (West Wing). There casting is smart because both are the same age and logically could be parents of a women in her late 20’s. Keener and Whitford have a history of being able to play supporting actors who’s roles are key to the success of the production. In Get Out they both succeed. 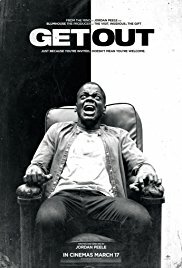 Get Out deliberately leverages off of tried and true filmmaking techniques and provides it in a fresh and enjoyable package.